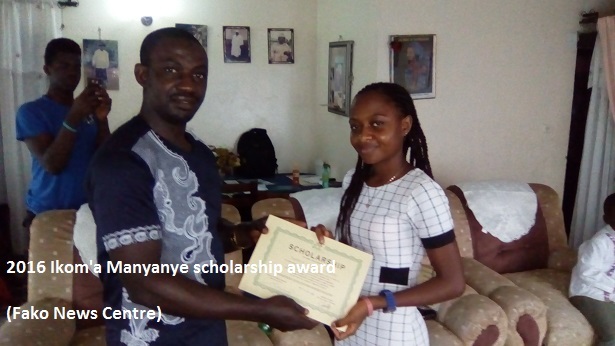 Another set of pupils and students of Fako Division origin have this year received scholarships and certificates from the Ikom’a Manyaye Foundation. The recipients of the 2016/2017 edition of the award were on Sunday September 4, 2016, awarded cash prizes ranging from FCFA 15,000 for those in Primary school level, FCFA 25,000 for those in secondary school level and FCFA 50,000 for those at the university level. 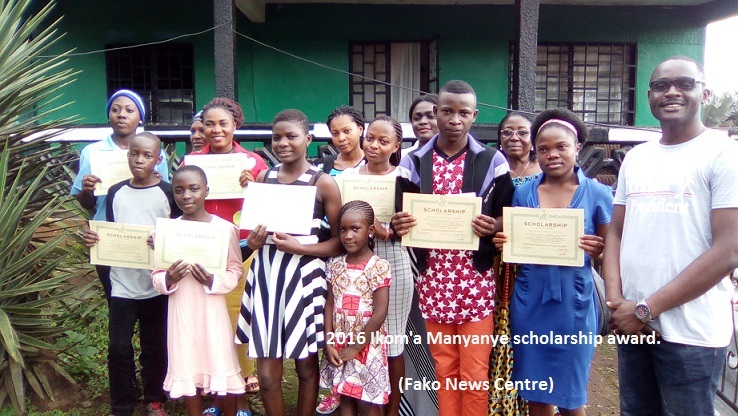 The event that took place at the late Ikom’a Manyanye residence in Wokwaongo (Bokwaongo) Buea subdivision, witnessed five laureates from the university level, four from secondary schools and one in primary school level. Addressing the laureates on behalf of the children of late Mola David Ikom’a Manyanye during the ceremony, one of the sons, I. K. Manyanye, congratulated the laureates for their excellent results. He explained that the selection process was very rigorous as they received several applications with excellent results. Mola I. K. Manyanye explained that most of the applicants were no selected because their application files were incomplete. He explained that the purpose for creating this foundation to reward academic excellence is to keep the memory of their late father alive who made lots of sacrifices for their wellbeing. Mola I. K. Manyanye told the students that they should work hard in school having in mind that they will not only be promoted to the next class or level but that someone can reward them for having excellent results. According to him, their wish is also to create a network of Fako students who will socialise with each other especially when they meet after events like the one they organised. Those who benefitted from this year’s award at the University level are, Nanyongo Grace Molua, Agness Nanyongo Mbua Ndumbe, Limunga Nganje Ruth and Imbolo Mafany Litumbe. At the secondary school level, Roy Nelson, Brandon Evakise Mbella, Merongo Norantine and Juliet Limunga are those who benefitted. While only Ikome Manyanye, a namesake to the Late Mola David Ikom’a Manyanye benefitted from the primary school level.